Breathing is the only essential bodily function performed unconsciously, that can be controlled consciously. Under unusual circumstances, body can go without food for weeks, water for days but body can't go without oxygen for more than a few minutes. 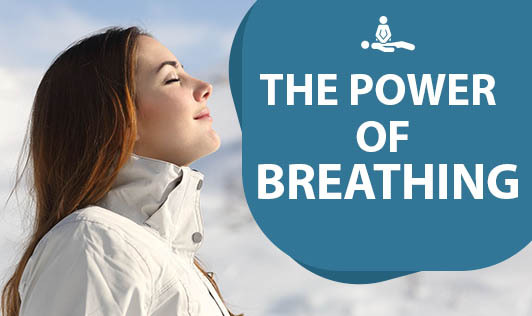 The power of breath has been known in India for thousands of years. Any type of quality yoga combines two powerful elements of breathing and stretching. Breathing deeply and slowly will relax you, while instantly providing increased oxygen to the brain and every single cell of the body. Carbon dioxide robs the body of oxygen. Carbon dioxide is poisonous to our body in high amounts and that's exactly why we breathe in oxygen and breathe out carbon dioxide. Breathing helps to synchronize both sides of the brain. The right nostril tends to stimulate the left side of the brain and the left stimulates the right side of the brain. Breathing has physiological effects on the body, some very noticeable and others not so noticeable. It can help give greater control over the nervous system. Anytime you're tired, stop and take ten deep breaths. The best way to breathe is in the pit (or bottom) of your stomach, as the lungs extend beyond the rib cage, in fact 2/3 of the lungs sit below the lowest rib. So filling the larger portion of the lungs will literally explode your energy. Breathe into the pit of your stomach, as deep as you can. Put your hand on the bottom of your stomach and push your stomach out as you inhale. Make sure you inhale through your nose. Breathe as deeply as you can, hold it, as long as comfortable then breathe out through your mouth. It's simple and can be done anytime. It helps lower stress, gives energy and infuses every cell in your body with the most precious element for the body, oxygen.